and company limited by guarantee (no. 5205390). Registered office: 10 Queen Street Place, London EC4R 1BE. Gail Farrow BSc - Gail is a founder tutor of Living Medicine. A practising medical herbalist and aromatherapist, she is an educator in Further Education teaching at Morley College in Lambeth and runs community education programmes in Walthamstow and Stratford. She is a member of the National Institute of Medical Herbalists (NIMH). Gail is committed to helping people improve the quality of their health though diet and lifestyle simply and inexpensively. Having seen the effect that life experiences can have on health with her own patients and their increased self-understanding, she began training in endobiogenics which acknowledges the importance of the autonomic nervous and endocrine systems in health. Anna Betz MCPP - Anna is a founder tutor of Living Medicine and a medical herbalist. Evolutionary perspective and systems thinking inform her approach to health and wellbeing. She has a particular interest in the prevention and treatment of chronic inflammatory diseases like diabetes and dementia. Anna is trained in mindfulness practices, transparent communication, narrative approaches and systemic family therapy. She also works in the NHS as a lead practitioner in dementia where she started Brainfood, a pilot project to teach patients and their networks about brain-friendly foods and healthy lifestyles. Her passion for building thriving and sustainable communities inspired her to co-found the School of Commoning and the HealthCommonsHub. She feels at home in places where individual, communal, organisational and social evolution meet and where people support each other in becoming whole by learning to embrace continually deepening and broadening perspectives of life. Alex is a medical herbalist and set up the first herbal clinic in hospital dermatology at Whipps Cross University Hospital, where she is tutor-practitioner to herbal BSc students. She also practises at The Haven, London's breast cancer support centre. She is a council member of the College of Practitioners of Phytotherapy (CPP), and formerly of the Aromatherapy Organisations Council. She has undertaken clinical research and is a visiting lecturer to universities including Westminster, East London and Hertfordshire. Originally a TV producer, she then worked as an aromatherapist for staff at Chelsea & Westminster Hospital, with drug users and those with HIV while training as a medical herbalist. Her quest is how we create health in individuals and communities at all levels, physical, spiritual and environmental. Simon is a leader in herbal medicine in the UK and internationally. He is a past President of The National Institute of Medical Herbalists and Chairman of the British Herbal Medicine Association. In Exeter he co-founded the first University centre for complementary health studies in 1987, the first integrated health programme at a UK medical school in 2003, and from 2002 the first Masters Programme in herbal medicine in the USA. Since 1997 he has been Secretary of ESCOP, a European network of experts in herbal medicine and on its behalf led the first major EU-wide scientific project in herbal medicines. From 1993 he created and led the development of EXTRACT, a powerful database tool to help those using herbal medicines in practice: the Herbal Hub will be the platform for this facility. Co-author of the modern classic The Principles and Practice of Phytotherapy, Simon founded SustainCare, a CIC and network to promote sustainable self-care (www.sustaincare.net). Carolyn is an architect, lecturer and writer. Her work has focused on the everyday lives of cities, and she has run successful design units at Cambridge University, London Metropolitan University, and at the London School of Economics. Her lecture series Food and the City is now an established part of the architectural degree at Cambridge University. A director of Cullum and Nightingale Architects, she has completed several major buildings for the Central School of Speech and Drama. Her media work has included presenting on BBC TV?s 'One Foot in the Past', and she is a regular columnist for Building Design. Her influential and award-winning book, Hungry City: How Food Shapes Our Lives, was published in 2008 and was featured on a special edition of BBC R4?s The Food Programme. Arthur has been cooking for 21 years. He has worked with Hugh Fearnley-Whittingstall and Pierre Koffman and was Head Chef at the River Café before going on to restyle Petersham Nurseries Café and relaunch Cecconi?s restaurant. He then became executive head chef for Jamie Oliver?s Fifteen Restaurant. In 2006 Arthur created two sustainably-aware urban restaurants, Acorn House & Water House in London, where he teaches 10 young trainees a year in sustainable catering. He wrote The Acorn House Cookbook and writes for the Guardian food/travel section. His regular TV and radio appearances include Saturday Cooks and his weekly slot on Market Kitchen, along with BBC R4?s The Food Programme. 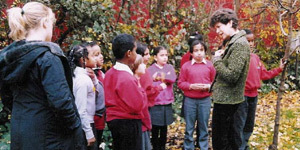 Normand Croft Community School, Fulham, eat vegetables from theirs and even grew wheat, making bread and crumble from the flour!